Despite the poor forecast for the weekend, I was surprised to see so many RS800s attending the Rooster 2018 National Tour at Datchet Water SC. 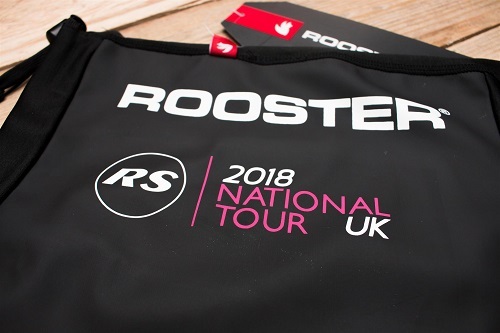 Was it in the hope of winning one of those Rooster RS 2018 National Tour Aquafleece® Neck Gaiters? Who knows – but with little prospect of starting racing on time due to so little wind, we sat and debated Datchet’s position on the Bacon Sandwich index. Then with a little rain came some wind and the fleet were despatched to the water. As newcomers to the RS800 fleet we were on a mission to work out how to control the boat at the starts and gain some starting experience. Now to say that we had wind would be an understatement, but there did appear to be more ripples on the right. Most of the fleet took the left hand bank whilst we practiced having a bad start and banging the right hand side. We lucked in. Despite what appeared to be the right call the Singletons managed to cross ahead from the left at the first mark. We rounded second and looked to pull out from the McEwens. Once again the McEwens were super slippery downwind. We struggled to choose the right time to gybe to take us to windward whilst Ralph and Sophie Singleton appeared to have their own private wind around the track. Fast and smart in equal measure. First was never out of the question for them. Third looked likely until the wind on the last lap put us under pressure and boy did we flap. Tim Gratton and Fiona Hampshire took some smart angles to take 3rd at the finish. Sunday dawned with a more promising forecast – but once again the wind in Datchet appeared to be going upwards rather than across the water. We were determined to get a front rank start this time so we made a jump, then tried to put the brakes on only to find that time and distance worked better. We were spat out again. We took an early right tack to clear our wind – it did not look like things were so bad. As we tried to piece a beat together on the right we found ourselves in last as the hard righters and hard lefters took us all by surprise. We were minutes behind but we worked hard to take a couple back. When newcomers Tom Tindal and Joza Cic passed us on the run with their main inverted the writing was on the wall. We nearly followed James Green and Jamie Trewick for an early shower – but instead we raced as hard as we could to pass them back on the next beat and close on the leading bunch. Finishing with one behind us was a major victory. Between the races it became apparent just how far forward the crews were sitting. Emma McEwen and Natasha Gladman were both auditioning for Kate Winslet’s role in the local new amateur dramatic production of RS800 Titanic, both sitting in front of the jib with their feet on the bow sprit. Armed with this new knowledge, Sarah set her mind to curl up even further forward and to leeward under the jib. Race 3 (2nd of the day) and we observed a master class in starting from Ralph Singleton. With just enough breeze to wire slightly Ralph was trapezing almost over the rudder to pin the boat to the water in the pre start. He then swung forward to unstick the boat as he accelerated. We were the soap once again. We were pinned out to the left and finally had the option to tack when we were dealt a large lift – just when you don’t want one. So we began our great circle route to the mark, but at least we had some wind. The rest of the fleet had less breeze but were now taking a sensible shift back to the mark on the right hand side. With one small ripple 100m upwind of the middle of the port lay line, we tacked, hoping to engage with this zephyr on port with perhaps some favourable shift. With 15 boat lengths to go it looked like we would round last but as Martin Orton and Ian Brookes followed Ralph and Sophie Singleton round the first mark the rest of the fleet were delt the hard blow of the shift from my zephyr - their approach on the starboard layline was now futile. We snuck round in the top 6. Once again luck favoured us as we approached the leeward mark with the little of whatever wind there was, Dan and Debbie managed to sail over their kite just at the mark and put the brakes on hard which slowed everyone down as they tried to avoid them or sail round them. Being tactically off the pace enabled us to sneak round the mark with some pace and take an early right hitch. There were stages on the next beat when I thought we were stationary. I was busy fighting the hook in my leach – I even tried max vang and max downhaul – that appeared to make some benefit – well at least we were not asking much of the wind. Beaten again by the skill and puddle craft of Dan and Debbie, then Emma and Luke, we followed dutifully round in 4th. Then there was a 60 degree wind shift on the procession to the speader mark; Luke and Emma had to drop the kite giving Dan and Debbie second with the last leg to go. Luke and Emma swiftly dropped the kite and tacked to round the spreader 3rd. Divine intervention (no - not beans for breakfast) then took over. We had our own private gust that took us over the McEwens and under Dan and Debbie to pop out clear and take second. With no prospect of any more wind the Race Officer kindly let us go ashore. Ralph and Sophie were the dominant force. Luke and Emma ever consistent. We were very, very lucky. The rest were robbed. At the prize giving the Rooster RS National Tour Aquafleece Neck Gaiters were given out to the newcomers Tom and Joza, and were rolled down the fleet to . You can only win these once you know. I have been coveting one of these for a while, and now I had finally been given one. With the Europeans at Carnac calling perhaps our starting will get better – it can’t get much worse.